I hung up the phone after speaking with an acquaintance, Ed. His emotional and spiritual temperature seemed to change with every set of daily circumstances. When something lent him favor, he was up and kind. He was humble when he positioned himself to see his blessings; when he forgot them, he was a different person. Without the gospel in his life, he tended to dive often off emotional cliffs that weren’t there. He acknowledged a miracle when he saw it and in the next breath, when an outcome wasn’t just what he expected, he was kicking and screaming. As he spoke, what I saw in my mind’s eye was, of all things, a fly. I saw it buzzing all over the place, never with a secure or lasting landing place, not being anchored to something that would allow it to be still, quiet. He was like that fly. I thought to myself, “He has no anchor in Christ, and is buzzing through life and changing colors with every event and happenstance.” I prayed for him. I had empathy for him and wanted to hand him a rudder of peace. I thought of each of us at times–bouncing around restlessly, and forgetting to or in some cases, not knowing how to avail ourselves of the peace and stillness of Jesus Christ. JesusChrist is the Way–He provides the rest stops, the stillness of being by clear waters. How do we avail ourselves of the Savior’s peace when anxiety seems to be an epidemic and worry and stress seem to be buzz-words or indicators of ‘a lot going on’ in our lives? Or when it rises unexpectedly? We all need to be reminded to lay our cares before the Lord Jesus Christ, and to do it with consistency. I can witness that I have felt that stillness in the eye of the most severe spiritual storms in my life, and I can also tell you that I have sometimes let go of it in the midst of minor confusion or pedestrian twists that arise in mortality. And then I go back to my Refuge, and He always, always, always, takes unsettledness from me, and I re-group spiritually. I walk away fine. Not that the outcome has changed yet, but knowing that He will orchestrate what’s best and use me as He needs to do so, if I will listen and respond. Having peace doesn’t mean all is resolved yet, or that I feel good because I’m taking a spiritual nap from my concerns or because I have a polyannish attitude that filters out life’s challenges. It refers to a godly peace that cannot be produced by us. It is produced by Jesus Christ. It comes as a spiritual gift. It comes as we really seek it and ask for it and rest in it. It is unassailable. It is not circumstance-dependent. It cannot be imitated or produced by Satan. (And, by the way, the persistently, intentionally wicked cannot know it; they may know relief from responsibility, it’s counterfeit which dies its own death, and they may know ‘truce’ but they will not know peace unless they repent and avail in the same way). I think we’re at a point in all of Christianity, and as Latter-day Saint Christians (members of The Church of Jesus Christ of Latter-day Saints), that we need to relearn the gospel truth that stillness is a fruit of and part of faith in Christ, and that while we’re here to experience a range of emotions–that will at times have us feel lost or afraid–they can be tempered by Him just as the seas were tempered by Jesus Christ (The Holy Bible: Matt. 8:26). Someone asked me, “How do you do it?” How did you navigate what you’ve gone through and seem so at peace? I thought and said, “Well, first of all, I’m through most of the storm you’re referring to. I’m at the other end from where you are, and that has given me time and perspective.” Then, I added, “I think what sustains me, really, is the Savior’s presence. I feel Him near. 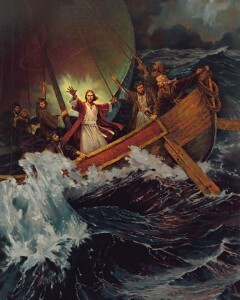 I feel that Jesus Christ is in the boat with me,” wherever I go, as long as I am striving to do His will. He was in the fire with me when I was in the fire. I really feel that. He guides me. He speaks with me. He shows me the way and His love and gives me wisdom, opens my eyes, names my circumstances, gives me a portal into the future. I then felt impressed to share this small personal instance of the same. I was cleaning the kitchen and mopping up the floor, thinking to myself after a very full, long, productive week on all fronts, that I wanted to go and sit and listen to the Lord, have some quiet time in my room reading scriptures, just listening at His feet. I put away the mop and went upstairs. Now, it’s funny. I usually sweep the floor and then wipe it up by hand, but on this day, I dust-mopped first. Once on my bed, I happened to open a book and read something like this: “Sometimes we just need to put the mop down, get out of the kitchen and listen at the Savior’s feet.” Now, how could I ever have found those words myself, replicating my own self-talk just about 2 minutes prior to that experience. I couldn’t have. The Lord orchestrated that moment for me. He revealed Himself to me: I felt His love, His presence, His awareness of the details of my life–even mopping the kitchen floor. Truly, Jesus Christ is in the boat with us. He is in the kitchen and the workplace with us. He knows when we pull in the driveway and what we are listening to on the radio, and what our deepest longings are. He knows the things that tend to rattle us. He can still them. I think He is calling out to us: “Let me still you. I will do it if you will only let me. I would love to if you will only let me,” when Jesus says, “Come unto me, and I will give ye rest.” He calls for the trust exemplified in this verse of Psalms 85: “I will hear what the Lord will say; for He will speak peace to His people, to His godly ones.” God grants peace to those striving to do the right thing. I’d like to close this post with a prayer Paul shared as he closed his first letter to the Thessalonians. Ministering to the people of his congregation, some of whom were undoubtedly worried, he spoke these inspired words: “May the Lord of peace Himself continually grant you peace in every circumstance. The grace of our Lord Jesus Christ be with you” (3:16, 18). I like the word, “continually.” May we each find Jesus Christ, first of all, learn of the fulness of his gospel as taught and administered only in the Church of Jesus Christ of Latter-day Saints–the Savior’s re-established Church in our day, is my hope and invitation to each of you who may be seeking to find your way, or to find your way out of worry and fear of any kind or degree. Karen Trifiletti is a single mother of two, convert to The Church of Jesus Christ of Latter-day Saints (Mormon), and business professional.